Alvin maintains frequent communication with the support ship during each dive and at all operating depths. Alvin’s UQC underwater telephone, which is compatible with Navy systems, can be used for both voice and code communications with Atlantis. An identical unit on Atlantis can interrogate the submersible for ranges, and Alvin may interrogate the support ship as well. 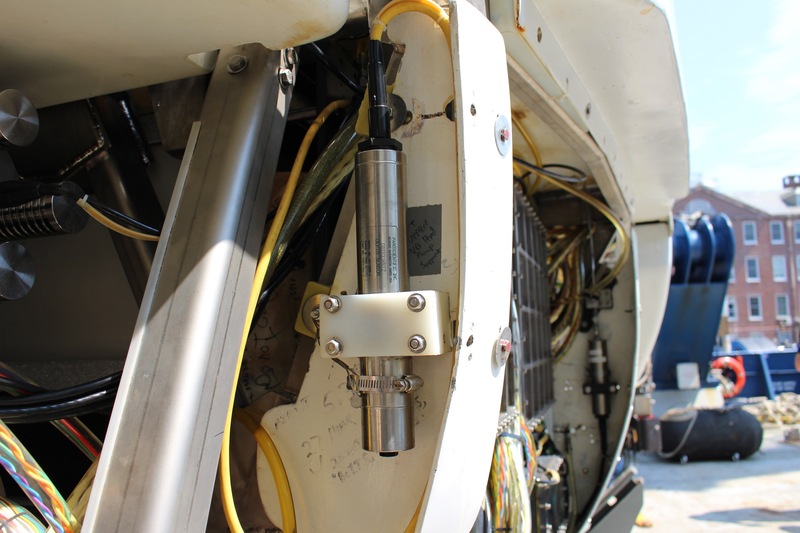 Since Alvin has both “up-“ and “down-looking” transducers, the UQC may be used to echo range to the bottom to determine altitude, or to the surface to determine depth. A VHF radio with all marine channels is used for communication when Alvin is on the surface. An all-channel portable VHF marine radio is carried as a backup and Atlantis is equipped with a marine VHF radio direction finder. The direction finder receives only marine VHF frequencies; users of VHF beacons should confirm reception capability before planning use of the direction finding equipment. One of the biggest advantages of using a human-occupied vehicle for science is having the ability to take in the context of the environment firsthand -- to be able to see areas of concentration and sampling within the larger environment. The addition of Alvin’s high definition cameras, and the versatility of their mounting options, enables closer observation and allows images to be brought back from dives for further study and to help with subsequent dive planning. A joystick control and video monitor allows each observer to control the cameras, switch views, and start/stop recording from inside the sphere, and a recorder saves still images continuously throughout the dive. 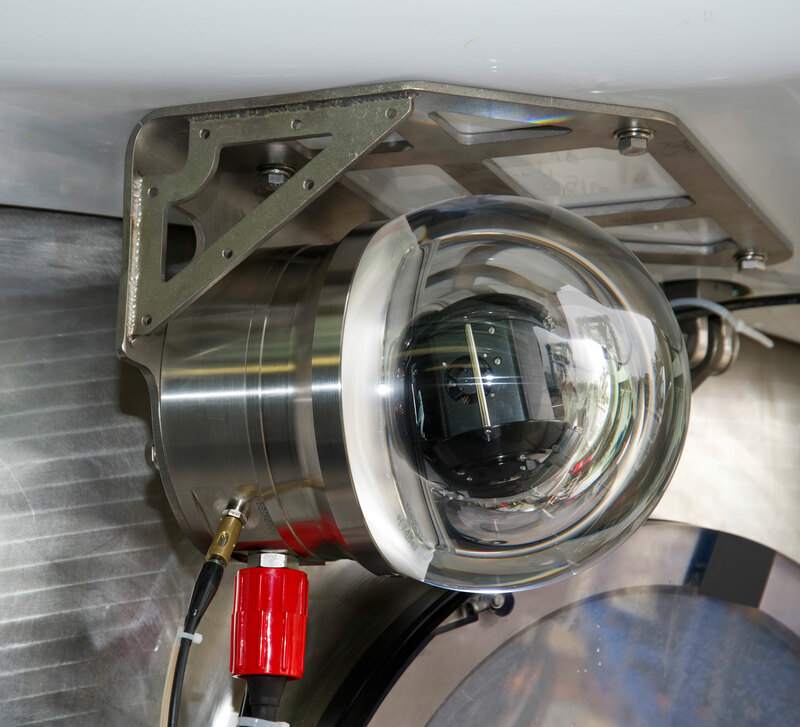 Two Insite Mini Zeus HD cameras with individual pan and tilt are mounted on the brow, above the port and starboard observers’ viewports. The Mini Zeus is a compact, high definition color zoom underwater TV camera in a titanium pressure housing. A quadruplet lens system maintains the performance of the zoom lens while underwater. The in-hull joystick controls focus (near/far and auto/manual), iris (open/close and auto/manual) and zoom (tele/wide). 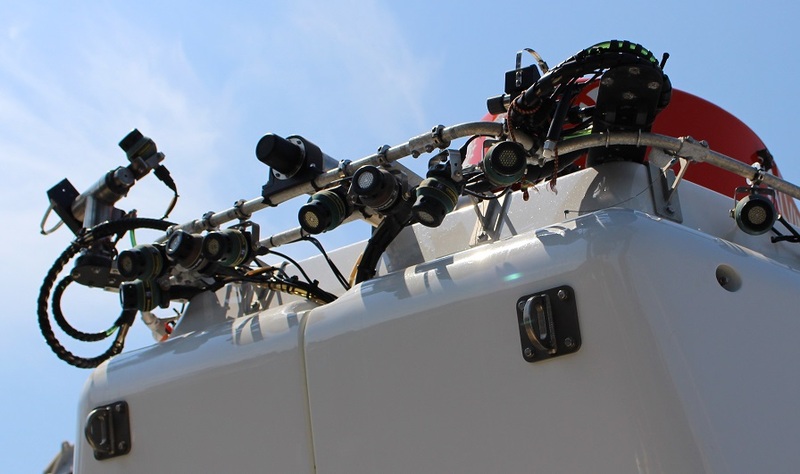 Two Kongsberg OE14-522 pan/tilt/zoom HD cameras are located just above and slightly outboard of the forward-facing port and starboard observer viewports. The OE14-522 is a high quality, high definition underwater video camera with a 10x optical zoom lens mounted on a movable platform inside the view port, giving pan and tilt functionality with no external moving parts. The in-hull joystick allows control of all camera functions including pan, tilt, zoom and focus. By default, the speed of pan and tilt is coupled to the zoom position, i.e., when the lens is at telephoto position the movements are slow; when in wide position, the movements are quicker. A SubC Imaging 1Cam Alpha is also available as another optional high definition video and 24.1 megapixel still camera. 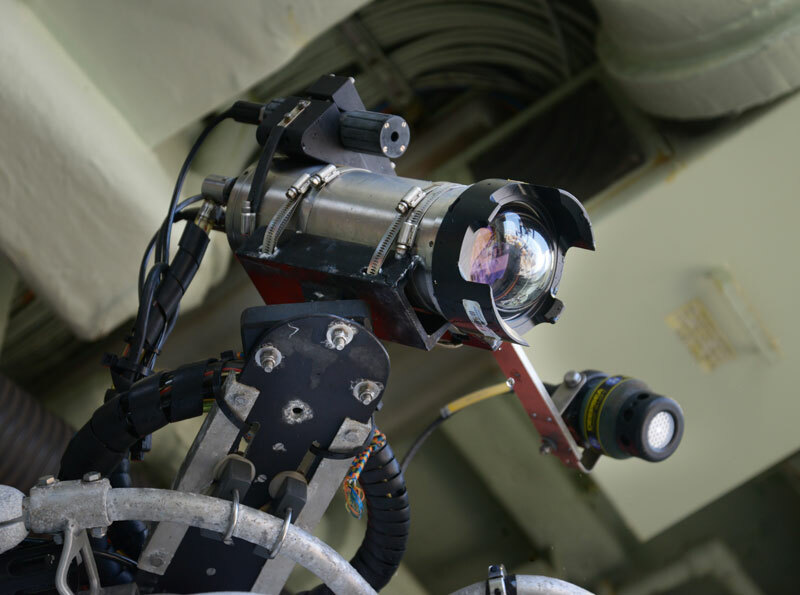 Interface and camera functions are controlled from inside the sub, and this camera is typically mounted on the starboard arm in a down-looking position, which also allows macro views. Alvin has three SONY PVM-740 HD LCD flat panel displays for in-hull viewing. Two are dedicated to science use and one is used by the Pilot. The PVM-740 is a 7.4-inch high resolution (960 x 540 pixel) portable monitor which incorporates an Organic Light-Emitting Diode (OLED) display. The PVM-740 offers outstanding high-contrast images, great for capturing images illuminated by the Alvin lighting system with the black background of the deep ocean. Video recording is accomplished with two Atomos Samurai 10-bit HD-SDI Recorder/Monitor/Players. Samurai preserves the quality from the camera’s sensor by directly encoding it into Apple ProRes® or (optionally) Avid DNxHD® as it records to HDD/SSD. Alvin has twelve independent lighting channels, each 10A, fused at 80A total. Ten 6,000 lumen DSP&L SeaLite Sphere SLS-6000 LED lights can be mounted around the sub to illuminate the work area, with one down-looking at the aft end of the sub. At least four lights mount around the basket and swing arm, with others mounted on the light bar on Alvin’s brow. Lighting can be configured as needed based on dive objectives. Constant current drivers allow flicker free operation, and they are fully dimmable via a GUI on the computer inside the sub. We have two optional green LED lights on the light bar, which increase visibility at distance. The HD pan and tilt cameras can each carry a pair of parallel lasers which can be used to help determine range, size or area of targets on camera. Beam convergence is adjustable for focus distance of 0.5 to 3 meters, but is factory set for 2 meters. An emergency cabin light automatically goes on inside the hull if power goes out. Alvin is fitted with two hydraulically powered manipulators. The starboard manipulator has six degrees of movement: shoulder pitch and yaw, elbow pitch, wrist pitch and rotate, and jaw open and close. The manipulator has a maximum extension of 72 inches and a lift capacity of 100 pounds at maximum extension. Remote operation is controlled by a switch panel in the personnel sphere. The arm may be viewed from either the front or starboard side viewports during operation and can be fitted with a hydraulic actuator that can be used as a trigger mechanism to operate devices held by the jaw. The port manipulator has the same six degrees of movement with the additional capability of wrist yaw. Maximum extension is 75 inches, with a fully extended lift capacity of 150 pounds. Wrist torque is rated at 30 ft/lbs and has a maximum rotational speed of 65 RPM. 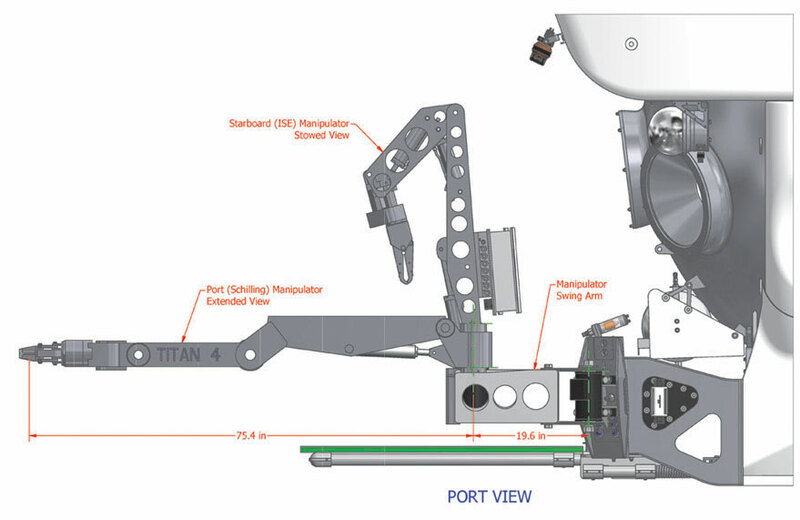 This arm is controlled by a position feedback master/slave mechanism, with the spatially correspondent master located in the personnel sphere allowing viewing and control through the front and port side viewports. This manipulator can also be fitted with an auxiliary hydraulic ram to trigger special equipment. Alvin’s primary navigation sensors are the Doppler velocity log (DVL) used in conjunction with the fiber optic gyroscope (FOG). Software integrates DVL information with data from all the other sensors on the sub and calculates the sub’s position and distributes the information to the Pilot in real time. The Pilot can then dial in what he wants the sub to do: maintain position over a certain spot to collect a sample (even in a strong current), hold a specified altitude or depth and ‘hover’ there, or follow a course or heading. “Step” moves are also possible, where the Pilot enters a shift of a desired amount and the vehicle complies. The scientist could say, ‘I want to spin in one spot’, and the Pilot could command the sub computers to make it happen. Alvin’s primary positional control is an advanced digital system that incorporates a variety of input devices. Typically the Pilot uses two joysticks that provide proportional control of the sub’s motion in the three directions (X,Y,Z). Alternate control is provided by a potentiometer/switch panel that allows scalar control along the three axes. Additionally, the system includes a number of propulsion modes including: auto heading, auto altitude, auto depth, auto X/Y, and “Stick Lock”. Selection of the various modes is available on the Command and Control touch screen and via dedicated push-button switches on the Pilot’s panel. The various modes and input methods may be utilized together to provide excellent maneuverability, including precise station keeping in the X,Y and Z axes and command of the sub in incremental steps along each of the axes. The sub’s command architecture includes a variety of inherent redundancies to accommodate minor issues with the propulsion system and prevent significant impact on dive objectives. Sampling tools are typically mounted to Alvin’s science ‘basket’, a robust and versatile platform located at the front of the vehicle, between the manipulators, and visible to all three occupants. The basket provides a 400-pound payload capability on 16 square feet (48” x 48”) of usable space for sample collecting, science tools, and specialized equipment. The basket frame provides many mounting options and can be routinely reconfigured to meet the specific objectives of each dive. The majority of basket preparation and configuration activity typically takes place the evening before a dive; minor adjustments and final preparation of sensitive experiments happen early in the morning prior to the dive. The science basket assembly is designed to be jettisonable in an emergency, so any instruments on the basket which require hydraulic or electrical power must be fed through a release mechanism supplied by the Alvin Group. Payload is attached to the basket with standard fasteners, and when possible should be designed with mounting flanges on the bottom that can accept ¼”-20 hardware. The basket design is modular, and it can be modified for special uses. The Alvin Group can also design and construct custom baskets or workspaces to accomplish cruise objectives. Alvin utilizes a Doppler Velocity Log (DVL) as a means to accurately measure the vehicle’s position and motion relative to the seafloor. 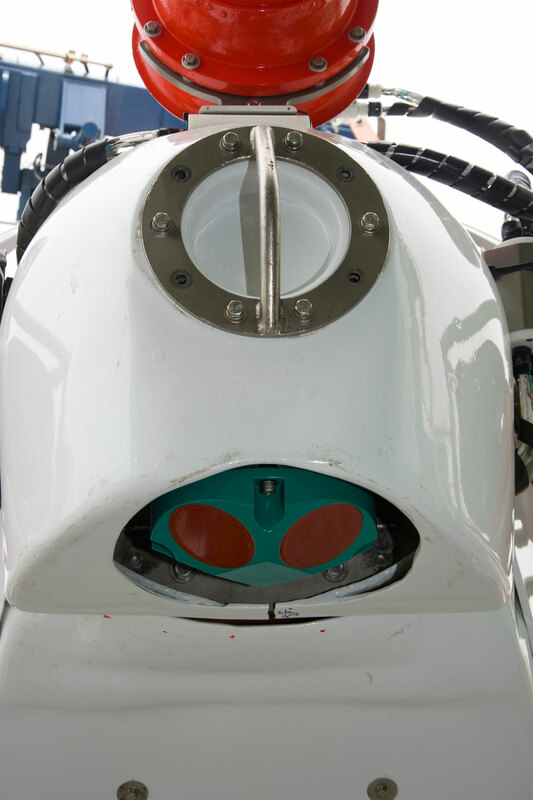 Currently the submersible utilizes an RDI Teledyne Workhorse Navigator operating at an acoustic frequency of 600 Khz. 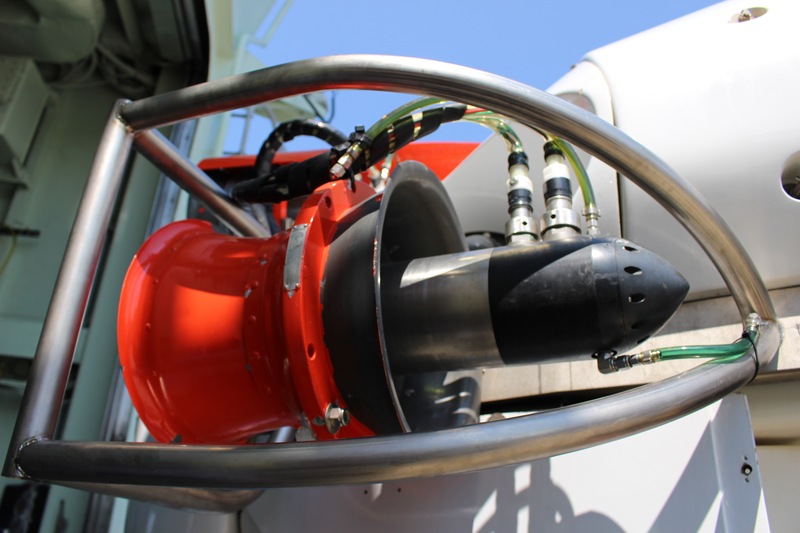 The DVL provides data at a high sample rate that includes position, velocity, heading (via a flux-gate magnetic compass), vehicle altitude (up to 90 meters above the seafloor), and vehicle attitude (pitch/roll). When Alvin is near the bottom (<90 meters altitude) the unit achieves “bottom lock” to accurately track the vehicle as it moves along the seafloor. During descent and then again on ascent, the unit achieves “water lock” to track the vehicle as it transits through the water column. Note that DVL-provided heading and attitude are used by the navigation system to calculate the vehicle’s position and motion. Primary vehicle heading and attitude are provided by the fiber optic gyro (see below). Both gyro and DVL heading as well as DVL altitude are displayed as a part of the Pilot’s command and control touchscreen interface. Other DVL data is available as a part of the vehicle’s output data set and viewable real time on the “Sensors” page of the command and control software. Primary vehicle heading and attitude are provided by an iXSea PHINS fiber optic gyro. The unit provides accurate vehicle heading and attitude (pitch, roll) to the navigation software. The Operations Group maintains a number of spare gyro units including a spare PHINS and an iXSea Octans. Both are available on an as-needed basis. 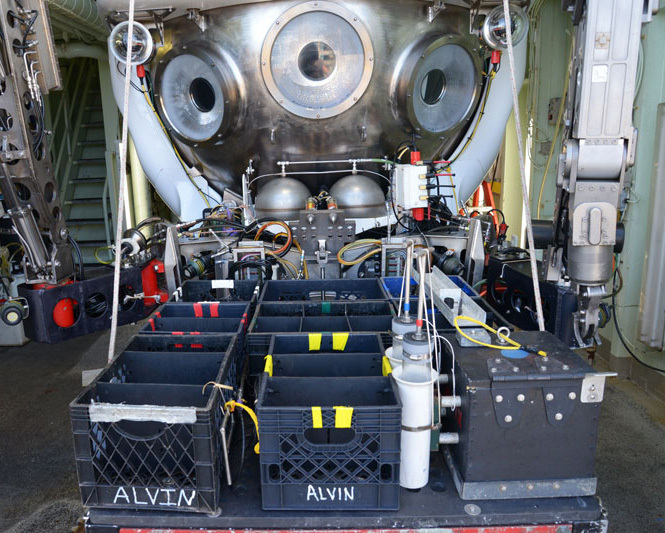 Alvin is equipped with two Paroscientific pressure/depth transducers. Both are temperature-compensated, precision quartz transducers, mounted symmetrically on the submersible (one on the port and starboard side of the vehicle at the same height and distance from the vehicle center of gravity). Measured external ambient hydrostatic pressure is used to calculate vehicle depth in meters. The resultant depth data is displayed on the primary command and control screen and is also available on the “Sensors” page of the C&C software. 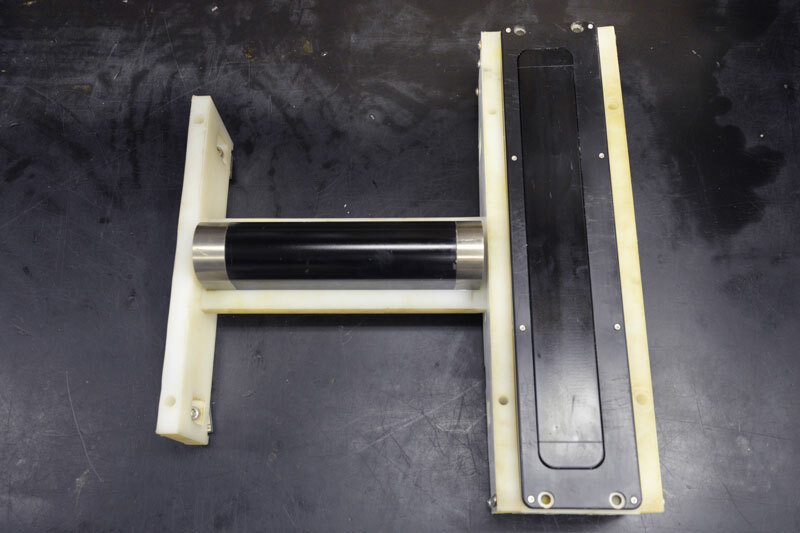 Depth transducers are routinely calibrated by the manufacturer (typically on a 24-month cycle). The Alvin command and control software logs calculated depth in meters and external hydrostatic pressure (raw). Local parameters (salinity, temperature, latitude corrections) combined with raw pressure may be used to calculate depth (user post-processing). Prior to May 1994, a constant of 0.6838533 m/psi was used to convert pressure to equivalent depth. As of May 1994 conversion has been based on: "Algorithms for Computation of Fundamental Properties of Seawater", by N.P. Fofonoff and R.C. Millard Jr. This algorithm assumes a latitude of 30 degrees, a salinity of 35 ppt, and a temperature of 0°C. According to this publication, "the correction for the actual density distribution would be 2 meters or less". The following table can be used to refine the observed and logged depth by applying a correction for the actual latitude of the dive. Alvin carries a small, analog hydrostatic pressure gauge, with a measurement bezel calibrated to read in meters. The external mechanical depth gauge displays coarse values of vehicle depth, principally as a backup to the two Paroscientific depth transducers. The unit is visible from the pilot and starboard observer viewport positions. The S08540 Super SeaKing DST sonar hosts two mechanically scanned imaging sonars in a single subsea pressure housing: a 300 kHz CHIRP sonar with a true operational range of up to 300 meters for long range target recognition, and a 670 kHz CHIRP sonar for ultra-high definition images with a range of 100m and a range resolution of approximately 15mm (minimum). The Imagenex 881 profiling sonar is standard Alvin equipment. It is used primarily for precision bathymetric mapping at altitudes from 5 to 15 meters above the sea floor with a maximum range of 100m. 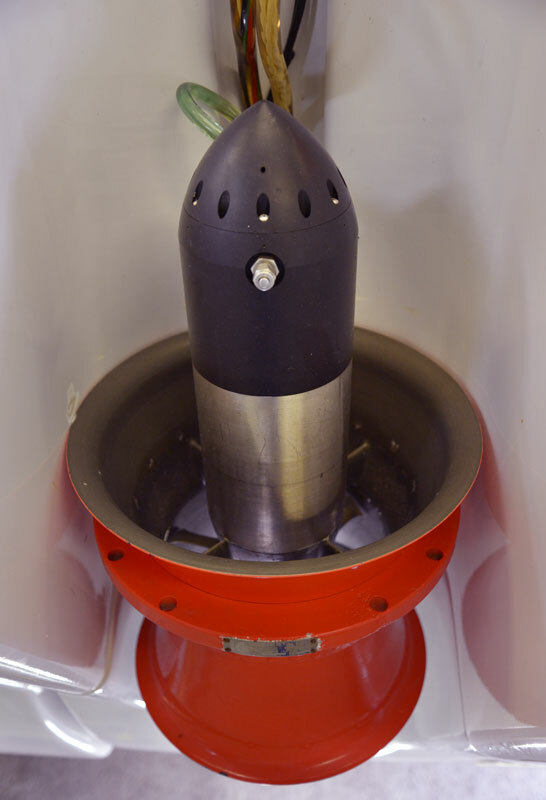 The single 675 kHz pencil-beam head projects a 1.7 degree conical beam and is positioned to scan from side to side in a 90-degree arc directly below the submersible keel. This produces a “zipper”-like contour profile of the sea floor as the submersible moves forward. Imagenex RS-485 data is stored in the in-hull computer and later downloaded post-dive for science user processing. Water weight is included in the submersible payload. The unit is mounted aft and requires no basket space. The availability of the Reson MultiBeam Echo Sounder (MBES) must be discussed with the Alvin Group during pre-cruise planning. The primary data collected by the MBES is bathymetric swath data; however, when desired other data can also be collected. 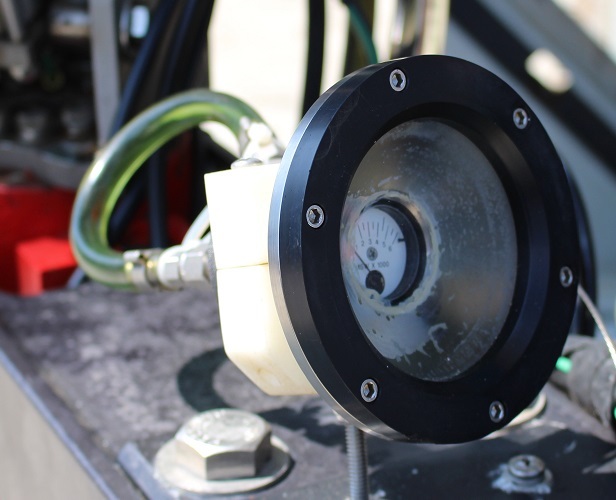 The trim system allows the pitch angle of the submersible to be adjusted by pumping as much as 500 pounds of ballast between tanks located in the bow and stern. 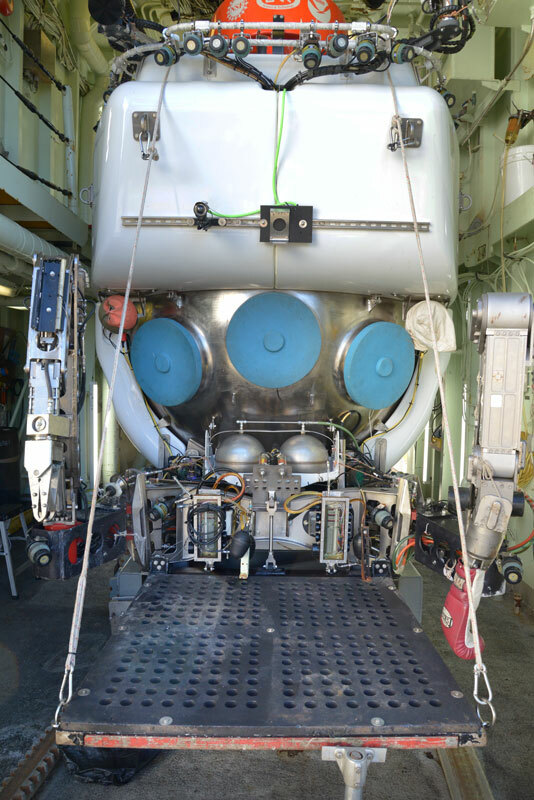 Normally, this system is used to maintain a level attitude as the load in the science basket varies during a dive, but it also permits the submersible to intentionally pitch bow up or bow down. The pitch range is approximately +/- 5 degrees. The variable ballast (VB) system is a fixed displacement, variable mass system that allows the Pilot to adjust the buoyancy of the submersible while at depth in order to achieve neutral, negative or positive trim, as well as provide reserve buoyancy for sampling payloads depending on the mission requirement at the time. Salt water is added or removed from spherical titanium ballast tanks to effect a weight change of up to 10 pounds per minute. This system can be used to neutralize the submersible’s rate of vertical motion, thus allowing it to hover in the vicinity of a cliff or underwater structure. Vertical travel may then be accomplished using the lift thrusters. For routine, near-bottom transits, the submersible is ballasted to be near neutral buoyancy. In cases where the bottom consists of light sediment, the Pilot may ballast about 10 pounds “light”, thus allowing the vertical thrusters to be consistently used in a manner which directs their water jets upwards. To prevent drift caused by currents, the Pilot may use the variable ballast system to get 50 to 100 pounds heavy. The amount of variable ballast weight available on each dive is not a fixed number and is affected by the payload on the dive. 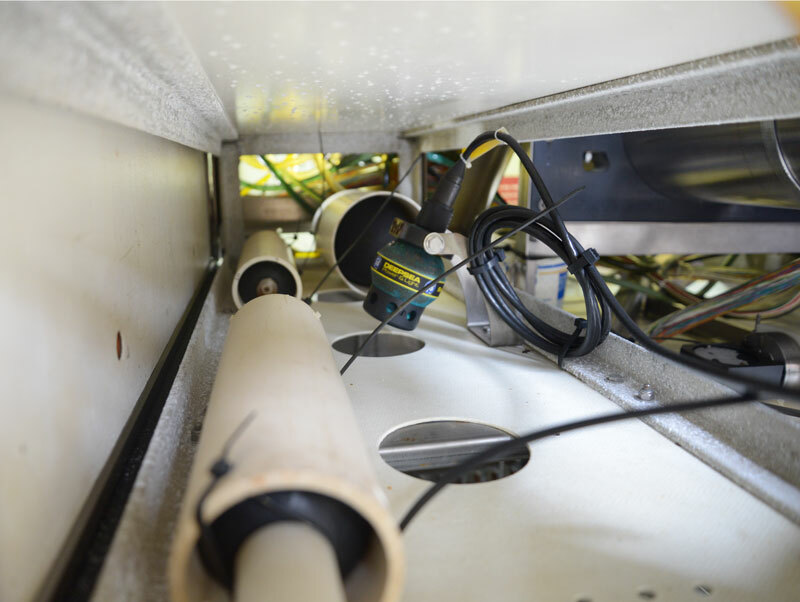 With advance notice, the ballast system can be configured to provide as much as 400 pounds of variable ballast. An additional negative force of up to 600 pounds can be applied by downward thrust of the lift thrusters for short periods of time. The VB system is both power- and time-consuming, and numerous trim changes will reduce bottom “work” time. The variable ballast system has been used reliably on Alvin for over thirty years. The system is not utilized for any safety-related functions, so its failure will not compromise the vehicle’s ability to return to the surface and be recovered. The design of the Alvin electrical system includes the capability to interface to a wide variety of science equipment. 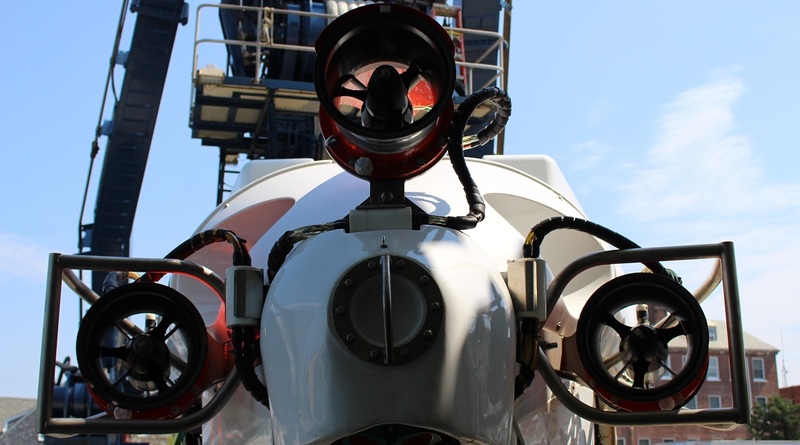 In general, though Alvin personnel will do their best to perform the final installation of the equipment onto the submersible, the specific condition or configuration of the vehicle may make one or more of these capabilities unavailable. To make this go as smoothly as possible, proper planning, testing and communication with the Alvin Group is recommended (also see Pressure Testing for User-supplied equipment). When delivering equipment to the Alvin Group, it is important to provide adequate documentation, including schematics, wire colors, connector types, and test documents (where necessary). The available volume for additional in-hull equipment is very limited. In general, only small hand‑held equipment should be considered for in-hull use. It is best for these to include a connector for their interface cable, so they can be disconnected for storage. There are a total of 46 through-hull wires available for science equipment use. These are all 16ga, fused at 10A (fast), and some are in twisted pairs. Because of wiring constraints, circuits using these conductors must be able to tolerate up to an ohm of end-to-end resistance on each wire. These wires are terminated in-hull in AMP 206838-1 circular plastic connectors (CPCs); the mating connector for this is AMP 206837-1. Outside, these terminate in one of the Science Basket J-boxes. There are six power channels available for outside science equipment use. Each of these is 24V at up to 150W, though full power may not be available from them all at once. Power channels terminate in one of the Science Basket J-boxes, and are controllable through the in-hull GUI controls. A high-power channel is also available: 120V at up to 10A. Specific arrangements must be made before planning to use this power channel. Additional power channels may be available for in-hull science equipment use, provided through the Data Power Controller. Voltages of 5V, 12V or 24V may be available, depending on other submersible equipment requirements. The Alvin data system consists of sensors, a data transport layer and data acquisition/storage in the form of in-hull computers. The majority of the sensors are permanently installed, including depth, altitude, CTD, etc., and are serial devices that use a serial to Ethernet bridge (Moxa) to transport data in-hull. Science wires are available and assigned as needed on a cruise-by-cruise basis if this architecture is not appropriate for your application. Data can be sent to any address on the network for logging and/or processing. The in-hull network can be accessed using the installed Alvin computers or via science-provided equipment. 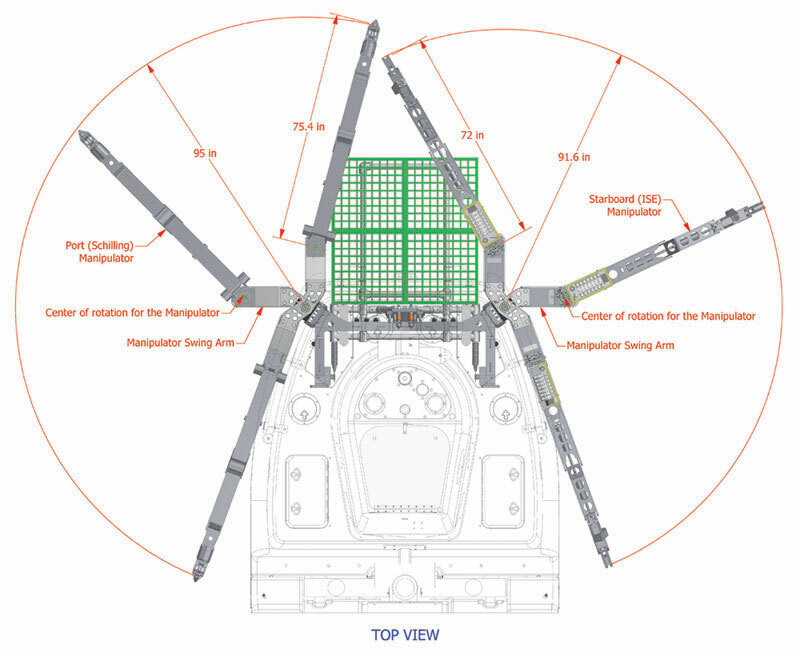 There are four multiplexed, through-hull serial data channels available for external science equipment interfacing. Each of these channels is full‑duplex RS232, up to 115 Kbaud. Outside the hull these channels are accessible in one of two Science Basket J-boxes. Inside the hull these channels are terminated in a DB-9S connector. Data may be accessed in-hull via the submersible’s network, using wired and wireless connections via a UDP transport layer, or it can be converted back to RS232 serial data. USB to serial adapters are available for use with laptops that lack RS232. If science wires are used, those connections are made available inside the sub through the Science Panel interface. There are several options for computing in-hull. First, there is a dedicated science computer running Windows 7 or Linux in a dual-boot configuration. This computer has Alvin network access and has limited peripherals available (one USB and one serial port). Alternately, the Alvin group can supply a toxicity/flammability tested Windows 8 laptop. If these options are not acceptable scientists may supply their own device, though this requires pre-cruise toxicity testing. In these cases please contact the Alvin Group as early as possible to review the testing procedure. Additionally, there are also two Ethernet data lines available for outside science equipment integration. Though these provide 100Base-T signaling, experience has shown that they actually provide significantly less data throughput. Outside the hull, these Ethernet lines are accessible in one of the two Science Basket J-boxes. Inside the hull, these lines are terminated in RJ-45 connectors. One of these Ethernet lines is frequently used by the arm-mounted science camera. Two optical fibers (SMF-28 or equivalent, Single-Mode, 9/125 micron) are available for science equipment use. These are terminated in ST. Though virtually any wavelength may be used, for compatibility it is recommended to have the in-hull equipment transmitting at 1310nm and the outside equipment transmitting at 1550nm. In-hull computing resources are available to minimize the need for separate scientific computers. Access to a computer (either installed or tablet) can be made available to run science equipment applications. 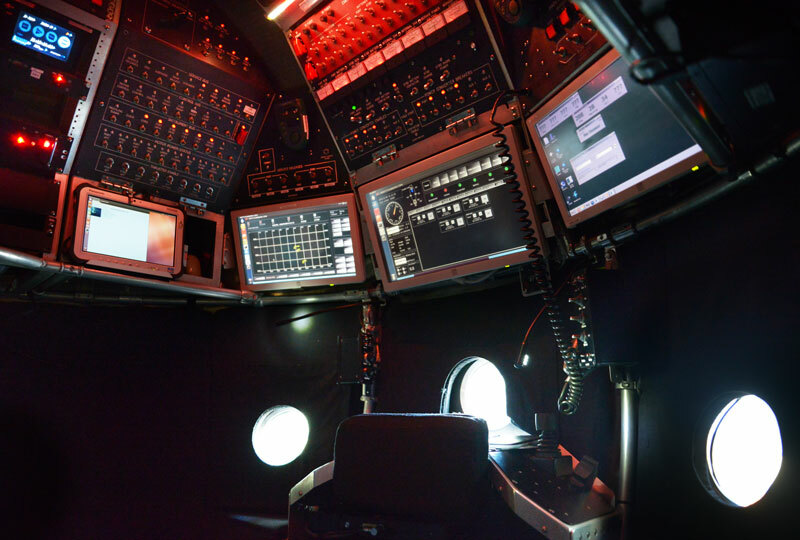 In general, these machines have modest computing capability, USB ports, and are on the submersible’s network. They are satisfactory for data logging and instrument control applications, though computationally-intensive functions should be saved for post-dive processing. The Alvin video system can handle multiple inputs of varying formats. In addition to the standard compliment of imagers, the system is flexible enough to allow the user to integrate custom-designed and commercially available video and still cameras both inside and outside the personnel sphere. In-hull, the RS232 control line (up to 115kbaud) is supplied on a DB-9S on the back of the Imaging Enclosure. The video connection to the camera is a passed through the hull on an optical fiber Teledyne DG O’Brien 1535015-166. The mating bulkhead connector is a Teledyne DG O’Brien 1535016-149. This expects HD-SDI (SMPTE 292M), converted to optical with a Telecast Rattler 3G, transmitting on 1550nm. In-hull, this video signal is normally integrated into the vehicle’s video system for display and recording. User-supplied recording devices can be used but must be cleared with the Alvin Operations Group and must pass toxicity and flammability testing protocol. The Alvin Group provides an in-hull hand held still/video camera. If the user would like to provide their own in-hull camera, it is recommended that it be battery powered and internally recording. If the camera provides an HD-SDI output it may be able to be integrated into the vehicle’s video system for display and recording. 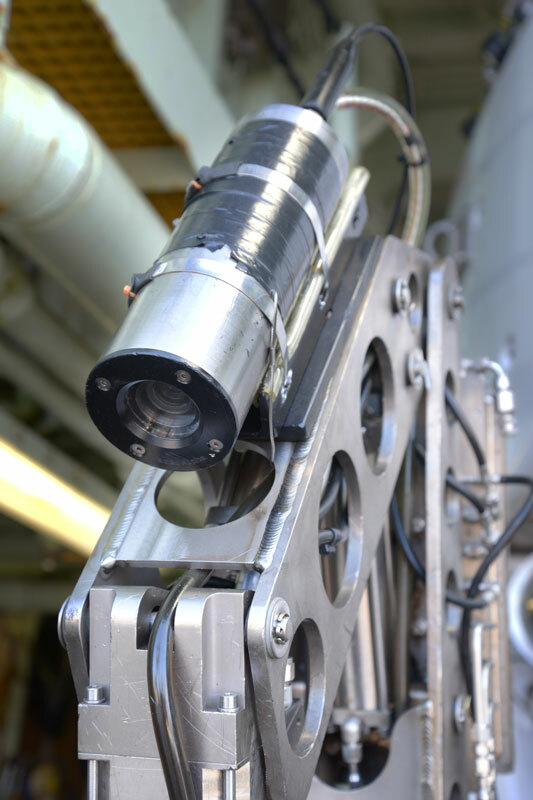 User supplied in-hull cameras can be used but must be cleared with the Alvin Operations Group and must pass toxicity and flammability testing protocol. Hydraulic systems can be an efficient method of supplying large amounts of mechanical force almost instantaneously. Hydraulic systems are also robust and reliable. Alvin utilizes hydraulics for several functions. Alvin’s hydraulic system is designed to supply hydraulic power for both submarine-specific functions and science applications. The system is used to power the manipulator arms, trim adjustment, and as a redundant source for variable ballast control. 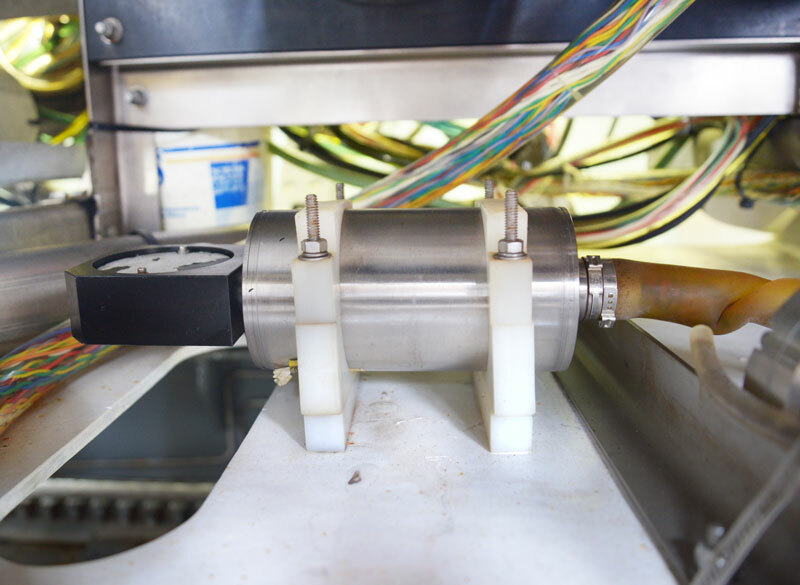 The hydraulic system can also power any science gear that uses hydraulics. Power is generated by a 4.5HP electric motor and an axial piston variable displacement pump. 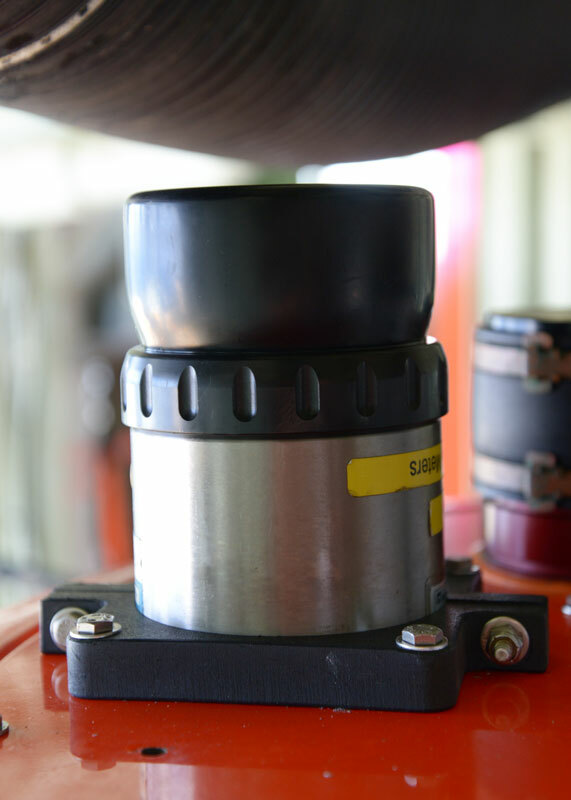 The Pilot distributes power via electronically-controlled valves. Five independent hydraulic control valves are available for science use. There are four variable flow control valves and one solenoid directional control valve. The Alvin hydraulic system also provides power for Alvin’s manipulators, trim system, and other accessories. 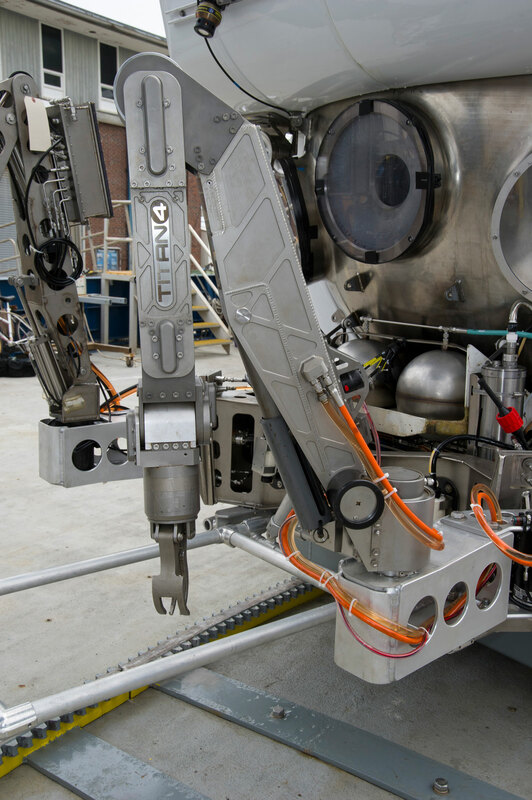 Hydraulically-powered science equipment is mounted on either the Alvin frame or the science basket. 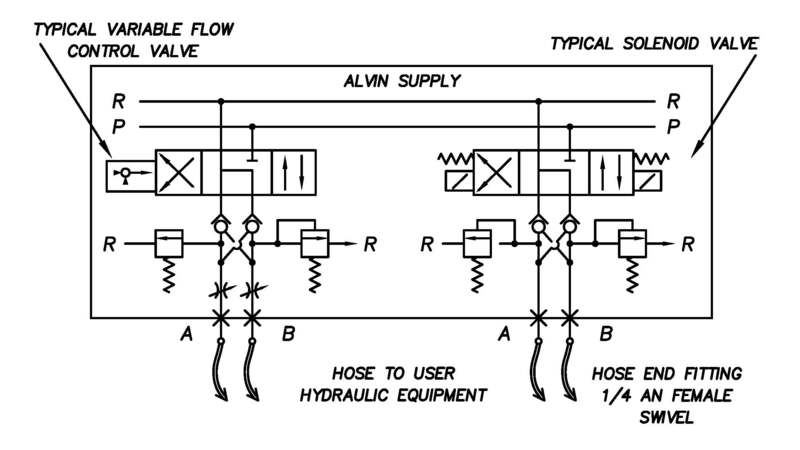 The figure at left depicts the pump flow and pressure characteristics of the Alvin hydraulic system. The pump is a variable displacement pressure compensated open loop pump. 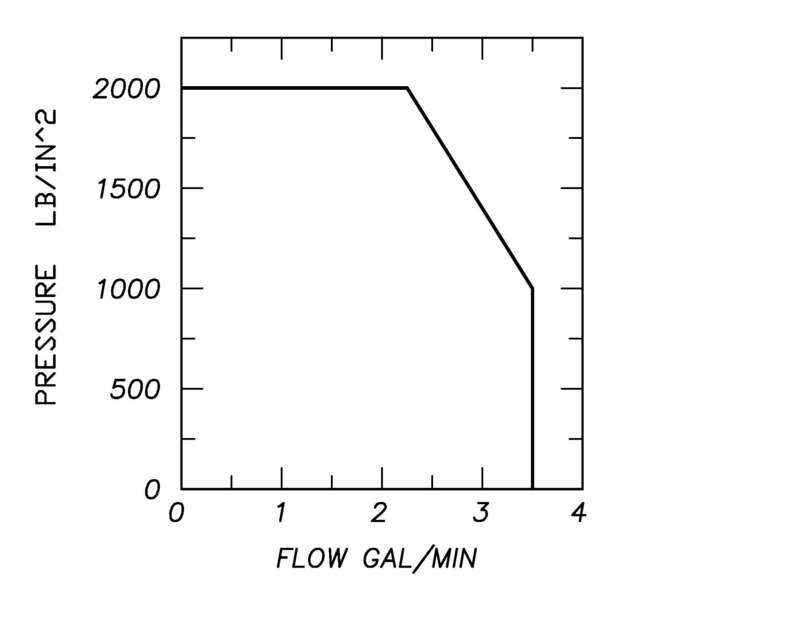 When designing equipment for use with the Alvin hydraulic system, the user should be aware that the flow versus pressure curve shown above represents the total flow available for allAlvin hydraulic systems: submersible systems and science. Therefore, the flow and/or pressure to science-supplied gear may be reduced when other hydraulically-operated submersible equipment is used, e.g., manipulators, slurp systems, etc. Users should allow for a 100 to 300 psi pressure drop between the pump and science equipment, depending on flow and operating temperature. For low flow applications (<2.2 gpm), the system can generate up to 2,000 psi pressure. For higher flow applications, (2.2-3.0 gpm), the system can generate between 1,600-2,000 psi pressure. When the port manipulator arm is activated, oil flow priority is given to the manipulator. The port arm requires up to 3 gpm and can use all the available flow for short periods of time. This can cause interruptions and/or reductions of performance in other hydraulic functions that are operating. If uninterrupted use of science hydraulic operations is required, the port manipulator arm should not be used when the science hydraulic system is on. The Alvin system uses Royal Purple Marine Hydraulic Oil. High pressure 10 micron and water removal filtration is provided. Note: Despite taking many precautions, the Alvin hydraulic system should not be considered “clean”. Science equipment must be robust enough to operate with potentially contaminated oil. Alvin uses flexible hydraulic supply hoses which are connected to hydraulic manifolds with 1/4" Swagelok fittings. Hoses used to supply equipment mounted on the science basket must pass through a disconnect plate to allow emergency release of the basket. All valve outputs are connected to pilot-checked relief valves as shown in the hydraulic flow diagram. These relief valves provide load locking to the limit of the relief. The control valves are normally operated by the Pilot from a panel in the personnel sphere. Solenoid valves are controlled by double pole, double throw (direction A or B), momentary, center-off toggle switches. The variable control valves work in a similar manner, except that the direction toggle switch connects the selected valve coil with a potentiometer that regulates the coil current and hence the valve flow in the direction selected. For the latest information on the hydraulic system, please contact the Alvin Group in advance of intended use of the science hydraulic system. The light bar is a 1 inch aluminum tube structure located on the brow of the sub. Alvin lights and cameras are mounted to the bar but there is also limited space available for mounting science equipment. Equipment mounted on the light bar must have relatively low mass due to mounting constraints and to minimize effect on stability. The light bar is best for small instruments which need to be higher up on the front of the sub. 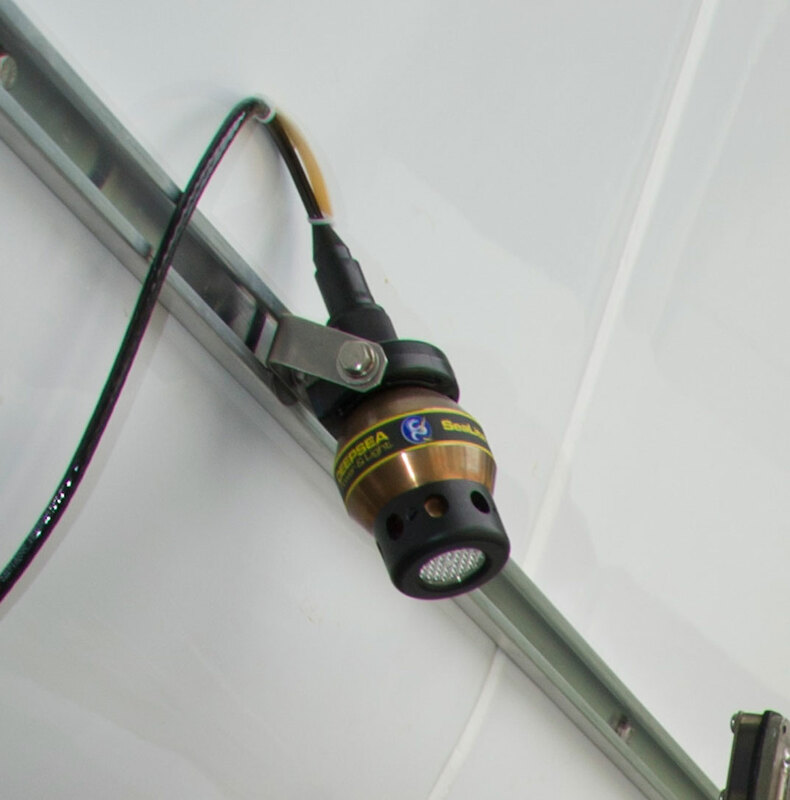 If space in the light bar is required, the user should supply the proper mount to attach the gear securely. 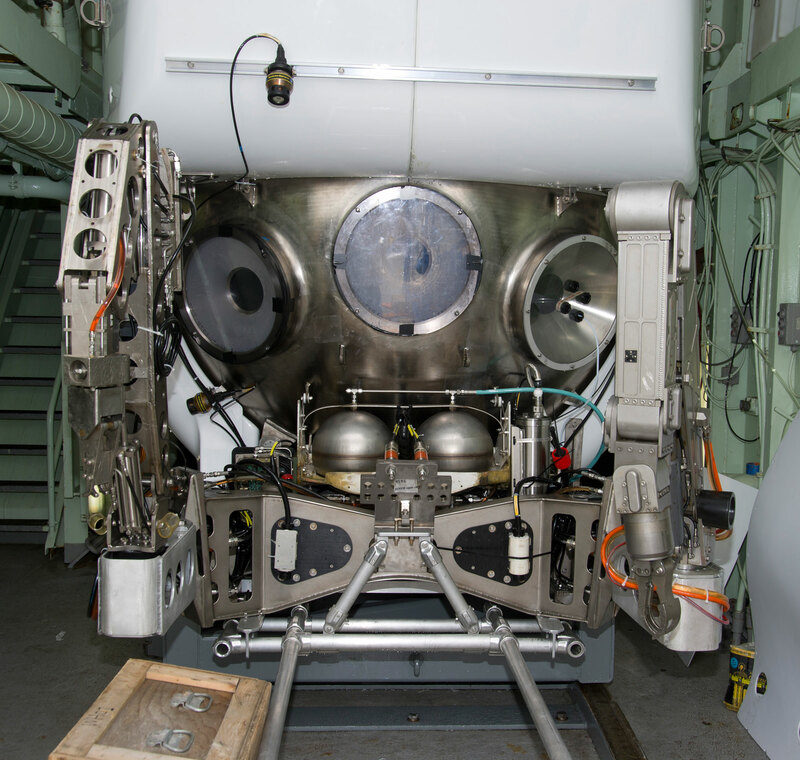 The aft science bay is a space underneath the submersible adjacent to the main batteries. It has a useable volume of 9.5 in x 12.5 in x 43 in. It is available to mount instruments and has an unobstructed downward view. Payload is limited to 100 lb in air. Mounting instruments in the aft bay will require modification of the existing bottom plate, or fabrication of a new bottom plate for larger instruments. If a new bottom plate is required, Alvin Engineering should be contacted to develop a mounting solution.